Rounded 15- to 20-ft. tree presents an all-season extravaganza! First, prolific, pinkish-red blooms. 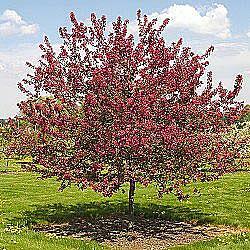 Next comes new purple-maroon foliage, that matures to reddish green. Fall brings a display of red, orange and purple, accompanied by glossy red fruit. Fruit persists into fall or winter and provides food for birds. Resistant to scab, rust, fire blight and Japanese beetles.